that are significant to the parents. The practice of circumcising baby boys (brit milah) has its roots in Abraham’s circumcising the male members of his household, as recorded in the biblical Book of Genesis. A parallel ceremony for girls (often called a simchat bat) is a contemporary development with historical and cultural predecessors, inspired by Jewish feminism, and practiced in most liberal and some traditional communities. Families and communities have also acknowledged and celebrated the arrival of babies in many other ways throughout Jewish history, and in different Jewish traditions throughout the world, with a variety of home and synagogue rituals of celebration and naming. For boys, the ceremony for brit milah (also known as a “bris”) traditionally takes place on the eighth day of life, and includes words of blessing, the circumcision itself, and the giving of a name. For many girls, the much newer simchat bat (frequently referred to in English as a “baby naming”) can take place on a variety of days. It often follows a similar structure as the brit milah, with one of several welcoming acts as the ritual centerpiece. Just as the longstanding tradition of brit milah for boys inspired the creation of parallel ceremonies for girls, the creative approach to tradition that has marked simchat bat ceremonies has in many cases shaped the way that brit milah is celebrated, for example, with fuller involvement of the mother, and an emphasis on themes equally applicable to girls and boys. 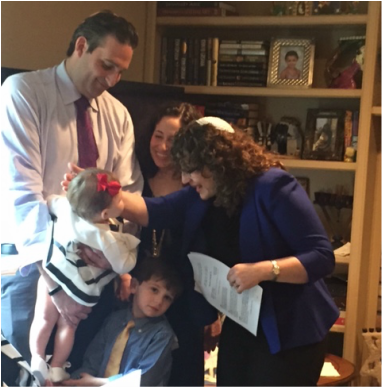 One of the greatest joys as a rabbi is to help families welcome their new babies into the Jewish covenant and community. I work with each family to create the right ceremony for them as a couple and as a family. I am happy to officiate at such ceremonies during a worship service, in the family’s home or at a private venue. You can contact me before the baby is born in preparation or once you have the baby and are beginning the planning stages. You can contact me here. "Rabbi Bravo came to our home and performed a touching and heartfelt naming ceremony for our daughter. ​and she made everyone feel like family." 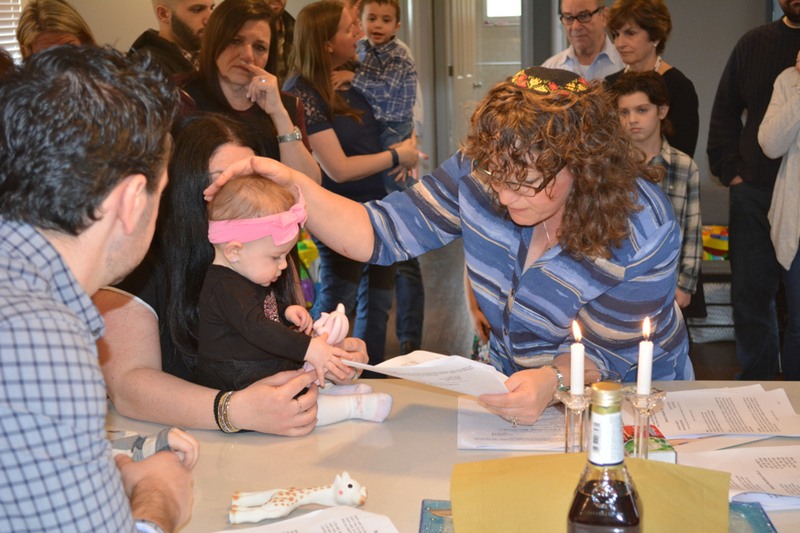 Rabbi Bravo officiated our daughter's naming ceremony in May and it was absolutely beautiful. Her ceremony was incredibly warm and we were thrilled that our parents, son, grandmother, siblings, and cousins were each able to play a special role. Rabbi Bravo and the our wonderful simcha. made helpful suggestions as to how to organize the ceremony, and answered all of our questions. the meaning behind the various parts of the ceremony. ​It was a beautiful day for our family!